A recent query about whether I had done a write-up on a Thunderbird Turbo Coupe compelled me to update this post written a few years ago, changing it enough to consider it a new entry. The aerodynamic styling of Ford’s 1983 Thunderbird was a breath of fresh air and a substantial change from the boxy and unloved eighth-generation 1980-1982 models, though the underlying components remained the Fox platform. 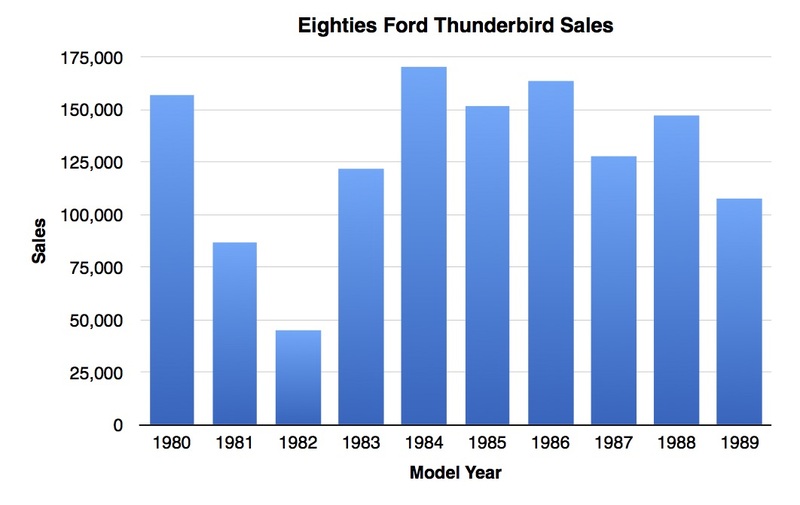 For 1983, the Thunderbird came in base, Heritage, and Turbo Coupe models. The Turbo Coupe featured Ford’s Lima 142 bhp 2.3 liter/140 ci inline four with Bosch L-Jetronic fuel injection and a Garrett turbocharger and came with a standard five-speed manual transmission. Road & Track recorded a 0-60 time of 9.7 seconds in a Turbo Coupe that weighed 3,420 pounds as tested. Ford’s new coupe didn’t just look aerodynamic—the drag coefficient was a very competitive 0.35. Fuel economy ratings for the Turbo Coupe were 21 city/33 highway by the standards of the day (17/24 by today’s standards). With an 18.0-gallon fuel tank, a Turbo Coupe owner could expect a range of between 330 and 435 miles with a 10% reserve—decent for a mid-size performance coupe in the early to mid-1980s. The Turbo Coupe started at $11,790—approximately $30,300 in today’s dollars and nearly what a 2019 Mustang EcoBoost Premium Fastback (also with a turbocharged 2.3 liter inline four) costs. Standard exterior and mechanical features on the Turbo Coupe included variable ratio power rack-and-pinion steering, power brakes, power mirrors, a Traction-Lok limited-slip differential, Marchal foglamps, and Goodyear Eagle HR 205/70R-14 tires (a size still readily available) on 14-inch x 5.5-inch cast aluminum wheels. Inside, all Turbo Coupe buyers got a leather-wrapped steering wheel, articulated front seats, and an AM/FM stereo radio. Options included front cornering lamps ($68), tilt steering ($105), power door locks ($172), and a premium sound system ($179). Two pages from the 1983 Ford Thunderbird brochure, linked from the Old Car Manual Project’s amazing brochures pages. Reviews were quite good—Road & Track‘s tagline was “An enthusiast’s Bird comes soaring back”—and the newly aerodynamic Thunderbird sold well. 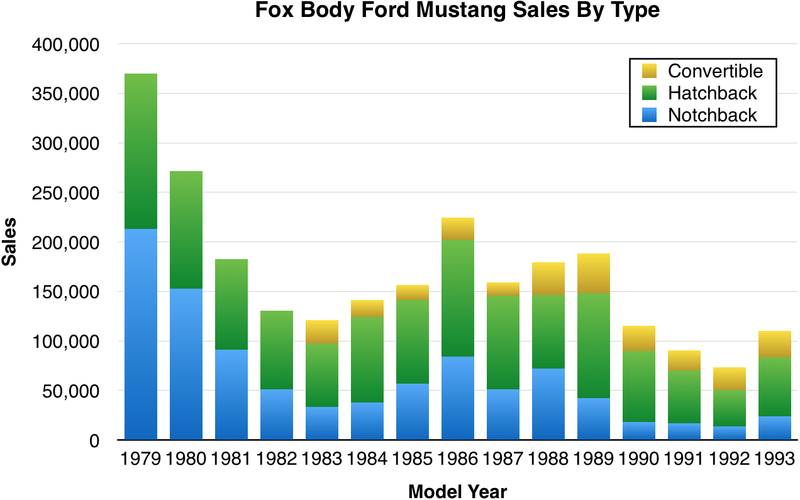 After dropping down below 50,000 sales for the 1982 model year with the last of the eighth-generation ‘birds, the ninth generation would not see sales of less than 120,000 per year. For unclear reasons, Hagerty’s valuation tools do not track any Thunderbird after 1982 (they do monitor the related Lincoln Continental Mark VII). Thunderbird Turbo Coupes only occasionally show up in the Hemming’s Motor News classifieds. You do see them more often on eBay Motors; as I update this blog entry in December 2018, there’s a 1985 Silver Clearcoat Metallic/Medium Charcoal Clearcoat Metallic two-tone Turbo Coupe with Oxford Gray cloth seats and 52,000 miles listed for $8,500. Make mine Silver, please. The 1983 Volkswagen Rabbit GTI three-door hatchback defined the “pocket rocket” for the US market, just as it had established it in Europe since 1977. The Giorgetto Giugiaro-designed Rabbit was a small car by modern standards—the 155.3-inch length puts it squarely in modern Mini territory and makes it about a foot shorter than a 2019 Golf GTI. Under the blacked-out, red-lined, and badged hood was a 90 bhp 1.8 liter/109 ci inline four with Bosch K-Jetronic fuel injection—an engine VW dared to declare was “brawny.” A five-speed manual transmission completed the rest of the powertrain—there was no optional automatic transmission. Car and Driver recorded a 9.7 second 0-60 time (Road & Track managed a 10.6 second 0-60) in the 1,918-pound car—faster than the same year’s BMW 320i and many other sporting cars of the era. Top speed was 104 mph. Fuel economy was rated at 26 city/36 highway (21/26 by today’s standards); a 10-gallon fuel tank gave a 210 to 280-mile range with a 10% reserve. Standard exterior and mechanical equipment in the $7,990 GTI (about $20,500 in 2018 dollars—well under what a 2019 Golf GTI S goes for) included vented front disc brakes, rack and pinion steering, halogen headlights, a urethane front air dam, and Pirelli P6 185/60HR-14 radial tires (a size still readily available) mounted on 14 x 6 inch “Snowflake” alloy wheels. Inside, a sport steering wheel borrowed from the Scirocco, heavily bolstered sports seats, a center console with additional gauges, and a golf-ball shift knob were included. Options included air conditioning (dealer installed), a sunroof, and an AM/FM stereo with a cassette player and four speakers ($450). The 1983 Rabbit GTI got good reviews (Car and Driver included it in their first 10Best) and sold well—Volkswagon built about 30,000 copies over two years at their Westmoreland County, PA plant. First-generation GTIs certainly have a following, but many were driven hard when no longer new, so there’s a paucity of cream-puffs out there. According to Hagerty’s valuation tools, all the money for a 1983 Rabbit GTI in #1/Concours condition is $18,200, with a more normal #3/Good condition car going for $6,000. Values are also up notably; that perfect #1 car was only $10,700 five years ago. GTIs sometimes show up for sale in the Hemmings Motor News classifieds and on eBay Motors, but there were none for sale when I updated this blog entry in December 2018. Last Sunday morning, I saw a Grand National actually being driven. The silhouette was distinctive even from a quarter of a mile away. Strangely, they look tall and even a little bit fragile in 2015. 1984 was the first year that Buick offered a Grand National package for the Regal. 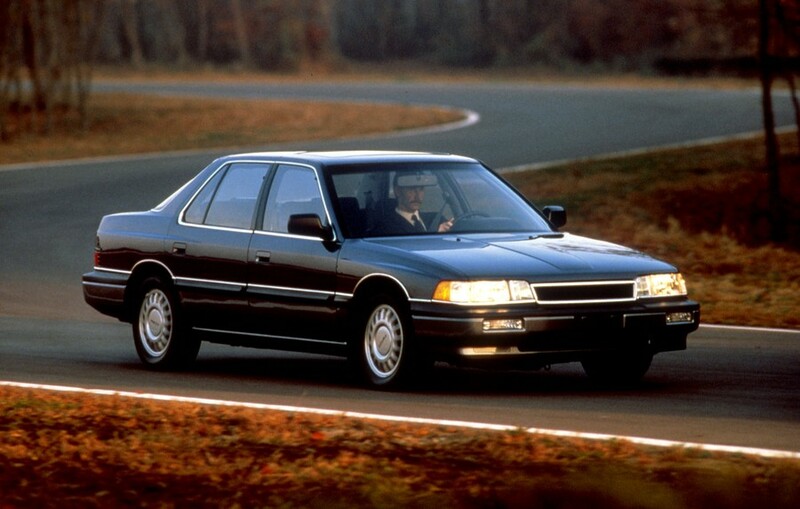 The Regal T Types had debuted in 1983, but the Grand National definitely kicked things up a notch. The star was, of course, the engine. For 1984, Buick’s turbocharged 3.8 liter/231 ci V6 gained sequential fuel injection, bumping horsepower up from 180 bhp to an even 200 bhp. Paired to a four-speed automatic transmission, 0-60 came in a little under 8 seconds. Mileage was 18 city/22 highway by the standards of the day (16/20 by 2015 standards). With an 18-gallon fuel tank, range was between 290 and 325 miles with a 10% fuel reserve. Standard mechanical equipment on the $13,400 Grand National (about $32,100 in today’s dollars) included power brakes, power steering, dual exhausts, performance rear axle, Gran Touring suspension, and P215/65R15 blackwall tires on black-accented aluminum wheels. 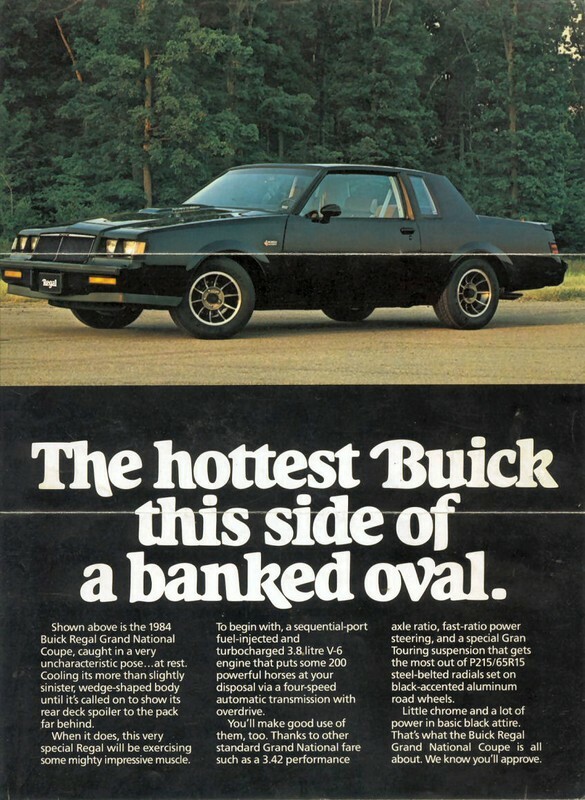 A Grand National’s exterior equipment included a turbo “power bulge” on the hood, dual mirrors, dual horns, front air dam, rear decklid spoiler, and that distinctive black paint with black accents—responsible for the “Darth Buick” nickname. Air conditioning, Lear Siegler cloth/leather seats, a tachometer, a turbo boost gauge, and a leather-wrapped steering wheel were all included inside. Optional equipment included dual remote sport mirrors ($30), electric rear defogger ($140), touch climate control air conditioning ($150), tilt steering ($110), power windows ($185), Twilight Sentinel ($57), and electronic tuning AM/FM stereo radio with cassette and graphic equalizer ($605). 1984 Buick Regal Grand National flyer, linked from the Old Car Manual Project’s amazing brochures section. Buick Regal Grand Nationals have a fanatical following. According to Hagerty’s valuation tools, all the money for a 1984 Grand National in #1 condition is an astounding $38,700, with a more normal #3 condition car going for $12,700. Grand Nationals frequently show up for sale in the Hemmings Motor News classifieds and on eBay Motors. As I write this in July 2015, there’s a 1986 with 28,000 miles available for $28,000. I don’t have to tell you what color I want mine in. 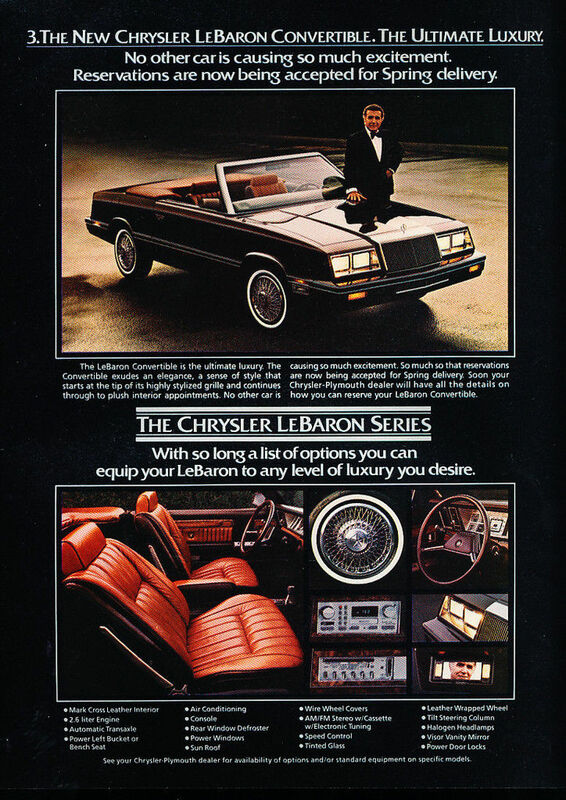 The Chrysler LeBaron convertible was a mid-year introduction, becoming available in the spring of 1982. It was the first factory convertible from an American manufacturer available for sale in the United States since the 1976 Cadillac Eldorado. All LeBarons were all-new for 1982. Based on the more plebeian Dodge Aries/Plymouth Reliant front-wheel drive K cars that had been on sale for a year, the LeBaron (sometimes described as the Super-K) was a move at least slightly up-market. Most exterior body panels were the same as the K. Notable styling differences were a waterfall style grill (somewhat resembling that of the previous year’s rear-wheel-drive LeBaron), quad headlamps, relocation of the parking lamps and turn signals to the front bumper, and a full-width tail-lamp housing. Chrysler used almost all of the standard K pieces inside the LeBaron. Recessed door handles and rocker type door locks were one of the few changes, along with a different style of armrest and door pull. There was less vinyl trim, and the carpeting and other fabrics were of somewhat higher quality. A significant difference was the attention paid to noise, vibration, and harshness: between soundproofing, better parts, and suspension tuning, the LeBaron was upgraded from the base K in 26 separate ways. Cars & Concepts in Brighton, Michigan heavily modified two-door LeBaron coupes on their way to becoming convertibles—the process included 32 steps. They installed a boxed-in backbone along the center of the car and welded a three-piece windshield header to the A-pillars. Next, Cars & Concepts installed new door glass and added door wedges. Finally, they added a new fiberglass panel to hold the rather small rear seats and mounted the convertible motor on the floor pan behind the rear bulkhead. The convertible top itself had a plastic rear window and broad rear quarter panels; Car and Driver wrote that this created “a sort of Conestoga-wagon effect.” The top was actuated from a button on the console, and a padded top boot snapped into place when the top was lowered. A K 2.2 liter/135 ci inline four with a two-barrel Holley carburetor producing 84 bhp was the base engine. A two-barrel carburetted Mitsubishi G54B 2.6-liter inline four with 92 bhp and 20 additional ft-lbs of torque was available for an added $171. Both engines were paired with a TorqueFlite three-speed automatic transmission. Mileage with the base engine was 25 city/36 highway by the standards of the day. The optional engine was rated at 23 city/31 highway and brought the 0-60 time down from about 17 (aargh!) seconds to about 15 seconds. The LeBaron convertible’s base price was $11,698 (about $31,200 in today’s dollars and about 44% more than the 1982 LeBaron coupe). For that money, you got dual outside mirrors (actually taken from the Dodge Omni 024), power brakes, power steering, and P185/70R14 whitewall tires (a size still readily available, though finding whitewalls might be tough) on 14-inch wheels. Inside you got vinyl bucket seats with a folding center armrest, digital clock, and an AM radio. 76% of convertible drivers moved up to Medallion trim, which boosted the price to $13,998 (about $37,400 in 2018 dollars) and added halogen headlamps, better gauges, and snazzier wheel covers. The Mark Cross package cost an additional $861, moved the sticker to a non-trivial $14,859 (about $39,700 in today’s dollars) and added the 2.6-liter engine, air conditioning, power windows, power door locks, and attractive Mark Cross leather/vinyl seats. Other options included cornering lamps ($57), cast aluminum wheels ($344), automatic speed control ($155), and an AM/FM stereo radio with electronic tuning and cassette player ($455). 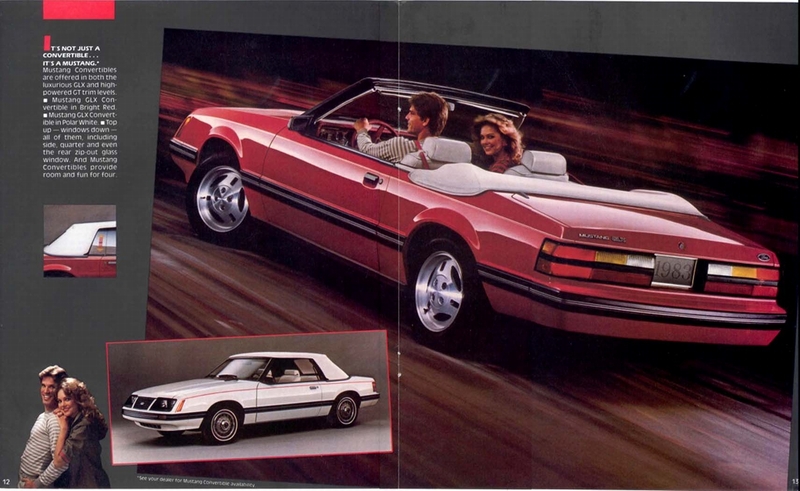 1982 Chrysler LeBaron convertible advertisement. First-year sales of LeBaron convertible were a respectable 12,825, especially considering the shortened year and the relatively high price. I would characterize In a piece of general eighties trivia, the first commercial cell phone call in history was made from a LeBaron convertible in October 1983. These cars are being collected and shown—I see them often at AACA judging meets. You see them for sale in the Hemming’s Motor News classifieds and on eBay Motors: as I update this blog entry in December 2018, there’s a Morocco Red LeBaron with 24,000 miles for sale on Hemmings for $10,800. These convertibles also started Chrysler’s long tradition of making convertibles that might occasionally be sporty but were not sports cars—a market niche they exited in 2014 with the demise of the Chrysler 200 convertible. I still like what Chrysler was trying to do, and I appreciate how these cars look, at least with the top down. Make mine Mahogany Metallic, please, with the Mark Cross package.